Kids love wearable crafts, and this easy-to-make headband example is perfect for a classroom, party, or Riddle Me treasure hunt. Parents enjoy the low-cost and easy cleanup, while kids love this entertaining craft activity that turns into something they can wear and then take home at the end of the party. The headband activity requires minimal supplies and can be assembled in a variety of ways. Depending on the style of headband the kids decide to make, it can take as many as 15-20 pipe cleaners, joined together, to encircle a child’s head. Purchase plenty, so there is no lack of creativity and experimentation to create the perfect headband. 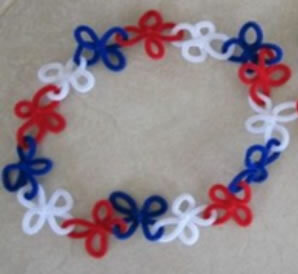 Extra pipe cleaners or other craft supplies can be made available if the kids wish to further embellish their headbands. If you are using this for a Riddle Me scavenger hunt activity, don’t forget to include these items at clue locations. Look for large-size chenille, nylon, or polyester craft pipe cleaners at the craft store, dollar store, or variety store. Craft style pipe cleaners are available with color, sparkles, stripes, and more. Look for thicker width pipe cleaners, from 1/4” up to 1 and a 1/4”, and at least 12” in length, for fuller headband results. Kids love colors, so search for multi-packs in a variety of bright and bold colors that match a themed party or allow them to get creative with color combinations. If you are leading the kids, twist a couple of pipe cleaners into flowers, geometrics, animals, or other shapes to give the kids some ideas. With several shaped pipe cleaners in front on you in a variety of colors, loop (or chain) them together to create a headband (or crown). The beauty of pipe cleaners is in the twist and turn function. Because of the thin layer of wire beneath the fuzz, pipe cleaners can easily be secured together. Be sure to tuck or fold any loose ends of the wire to prevent exposure to the skin. The finished headband is ready to be gently placed on top of the crafter’s head. This easy craft is a chance for kids to use their imaginations to create a headband in the styles and colors that make a statement. Whether they want to come up with an idea of their own or create a themed headband can be completely up to them. Action figures, fairies, and cartoon characters are just a few examples of what they might want to create. Take a group snapshot at the end of the party, and post it to Facebook for the parents and kids to enjoy. Leftover pipe cleaners can go a long way toward multiple craft ideas. This craft can be incorporated with a Riddle Me activity for even more fun and entertainment! Just stow the pipe cleaners along the hunt trail or at the destination and double the fun as the children find the materials for their activity that will follow.